When Jamie Foxx makes his entrance on “The Late Show with Stephen Colbert” doing the traditional New Orleans second line dance, you know you’re about to witness something epic. The multi-hyphenated Jamie Foxx is perhaps the only man alive who can turn an on-air interview into his own variety show. 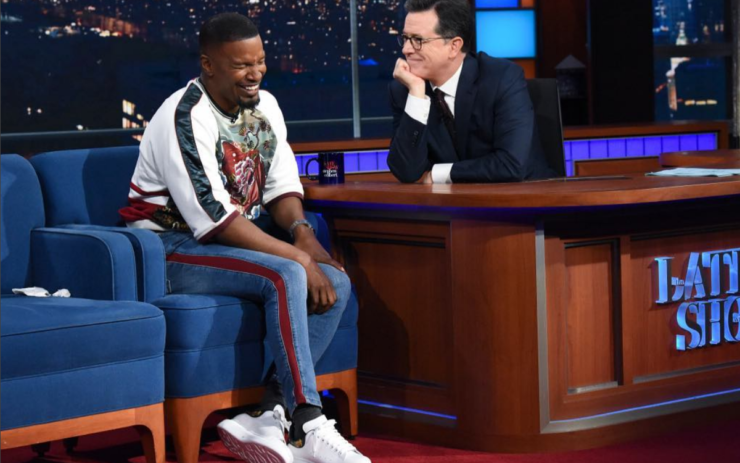 This Thursday night Foxx will be joining Stephen Colbert on “The Late Show.” Born, Eric Marlon Bishop, the “Django Unchained” star will be sitting down with Colbert for the first time ever. In the interview, audiences will remember why they have grown to love Foxx. Whether it’s because of his Academy Award-winning performance in the biopic “Ray,” as a guest vocalist on the #1 Billboard hit single, “Gold Digger,” or as the larger than life persona, Wanda, on “In Living Single,” Foxx has left an indelible mark on fans. At this point, Foxx is a Hollywood legend. Throughout the interview, Foxx tells stories of wild Hollywood nights with his, then up and coming, celebrity friends like Sean “Puffy” Combs and Pharrell Williams. Commanding the “Late Show” stage with his witty tales and sending the audience into spells of laughter, Foxx surprises Colbert and the audience by having a few of his party guests attend the interview via spot-on impersonations. As if the sit down could not get any better, Colbert surprises Foxx by inviting a special guest to the stage, bringing the comedian to tears. Expanding his repertoire, Foxx is adding the title of Gameshow Host to the list. For his new show, “Beat Shazam,” he is teaming up with his daughter Corinne to deliver a lively weeknight gameshow for families to enjoy. “Beat Shazam“ airs Tuesday nights on the Fox Network at 8 pm E/7 pm C.
Tune in to “The Late Show with Stephen Colbert“ as he interviews Jamie Foxx this Thursday night at 11:35 pm E/10:35 pm C on CBS.